The Democrat from Minnesota announced two weeks ago that he would resign in response to allegations of sexual misconduct. WASHINGTON — Sen. Al Franken, D-Minn., plans to resign his seat on Jan. 2 in response to multiple allegations that he touched women inappropriately, his office confirmed Wednesday. The decision followed Franken’s announcement earlier this month that he would leave Capitol Hill amid growing controversy over his behavior toward women prior to entering politics. The two-term senator, who has denied allegations from more than a half-dozen women that he touched them inappropriately or made unwanted sexual advances, will be replaced by Minnesota Lt. Gov. Tina Smith, a Democrat. Franken is one of seven lawmakers who have resigned or said they would not run for re-election after facing allegations of sexual harassment or misconduct. A spokesman for Franken confirmed his planned date of resignation Wednesday after Franken delivered a floor speech about education policy, one of several addresses he said he would give before leaving public office. “When I leave the Senate in a few weeks, I’ll continue trying to be an educated citizen, and an advocate, and an activist,” Franken said in an empty Senate chamber. Announcing his plans to resign on Dec. 7, Franken struck a defiant tone. 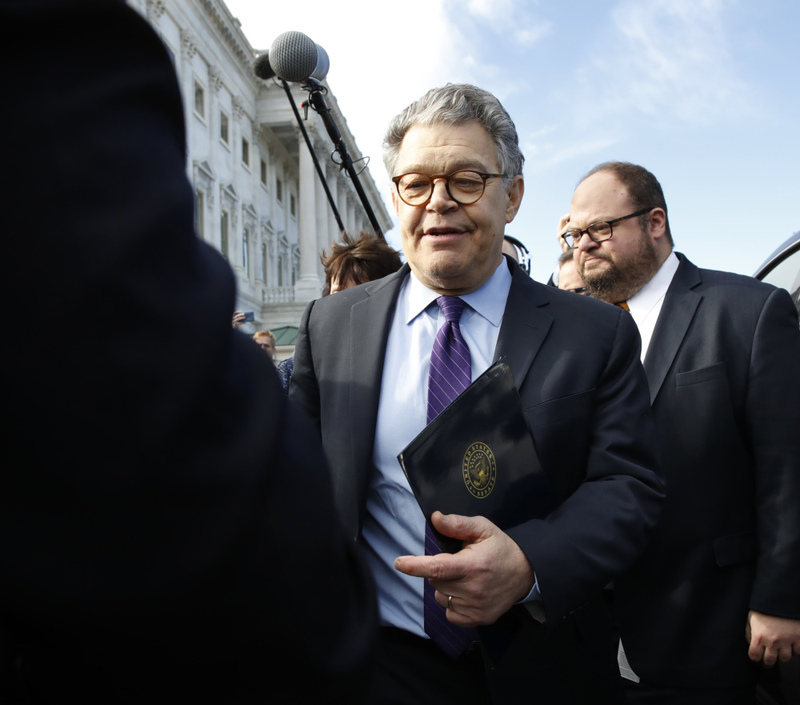 Franken, once considered a rising star among Democrats, made a jab at President Trump and former Alabama Republican Senate candidate Roy Moore, both of whom have been accused of sexual misconduct. Moore was defeated last week in a special election. “There is some irony in the fact that I am leaving while a man who has bragged on tape about his history of sexual assault sits in the Oval Office, and a man who has repeatedly preyed on young girls campaigns for the Senate with the full support of his party,” Franken said in his Dec. 7 speech. Franken’s decision to remain on Capitol Hill through December allowed him to cast several important votes, including in opposition to the Republican tax plan that received final approval from the House on Wednesday. He has complimented Smith, calling her a “dedicated public servant” and the best choice to fill his seat. “I look forward to working with her on ensuring a speedy and seamless transition,” Franken said recently in a statement. Franken is expected to speak at least once more on the Senate floor before his resignation, a spokesman said.